Ever since I purchased my Instant Pot 6 quart Duo, I have wanted to make Instant Pot Meatloaf and Mashed Potatoes that everyone raves about. So why is everyone going crazy over this meal? Instant Pot meatloaf and mashed potatoes – using no foil. First of all, it is a one pot meal. Both the meatloaf and the potatoes are cooked together in the pressure cooker. No more heating up your oven to bake the meatloaf. And no more standing over a boiling pot to make sure it doesn’t spill over. Just cut up your potatoes and prepare your meatloaf and in the Instant Pot it goes. And instead of dinner being ready in over an hour, it can be on the table in 30 minutes. Use a lower fat ground beef to decrease the amount of grease during cooking. Okay, so I am sold! This dinner sounds too good to be true. So I did a lot of research on recipe techniques and found some common trends. Rinsing your potatoes in cold water before cooking helps make light and fluffy mashed potatoes. First of all the potatoes are cut fairly large to accommodate for the cooking time for the meat. The potatoes are then placed in the bottom of the liner along with a thin liquid. Now I have not had much success with making mashed potatoes when they are cooked directly in the liquid. Every time I mash them, they turn out like paste. 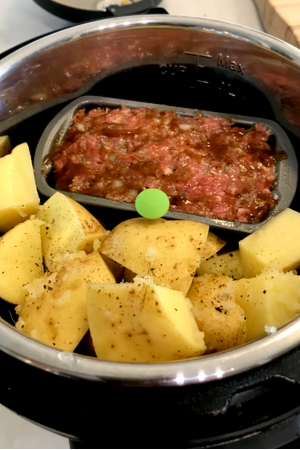 We use a collapsible steamer basket to hold both the potatoes and meatloaf pan. I also prefer to use chicken stock as my liquid. It gives your meal much more flavor as compared to when cooking with water. 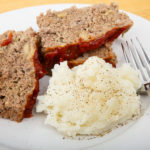 Those were two easy adjustments that I knew that I could make when I made my own Instant Pot Meatloaf and Mashed Potatoes. Every recipe that I researched used aluminum foil as the ‘pan’ for the meatloaf. Some people would poke holes in it to let the grease drain down into the potatoes. Others would simply fold up the edges and let the meatloaf drain into the foil. 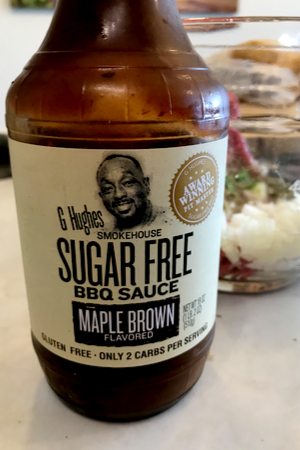 To add extra flavor to our meatloaf we use BBQ sauce instead of ketchup. I am not a big fan of cooking with aluminum foil when I don’t need to. Don’t get me wrong, there are times, especially when camping, that it is my best option. However, when I have a pan that can do the job, I prefer to use it instead of the foil. So what did I use instead? I found mini loaf pans that work perfectly in the Instant Pot! For this specific recipe, I only used one mini loaf pan. However, if I am making other recipes that require items to be cooked using the pot-in-pot method, I can stack two of them in the 6 quart Duo. 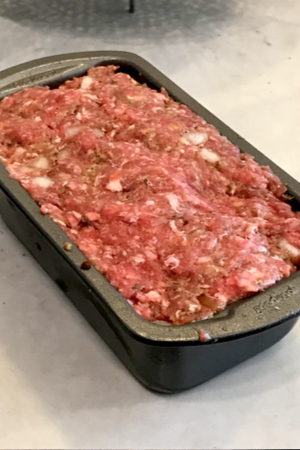 This mini loaf pan is the perfect solution for cooking your meatloaf. And because I also have the 8 quart Instant Pot, I have found that the two mini loaf pans can be positioned side by side when placed on the trivet. My 1 pound meatloaf fit perfectly in the mini loaf pan. There was no foil to worry about, and it was easy to put in and take out of the pot. Yes, there was grease that was inside of the pan. But it drained off easily because it was contained in an easy-to-handle pan. I used my collapsible steamer basket to cook the potatoes. I stacked the potatoes on one side and put the meatloaf pan on the other side. This recipe turned out amazing! It was the perfect amount to feed 3-4 people. And if you are looking for another comfort food recipe, try our Instant Pot Stuffed Peppers recipe. An entire comfort meal made all at the same time in the Instant Pot. The perfect recipe for 2-4 people! 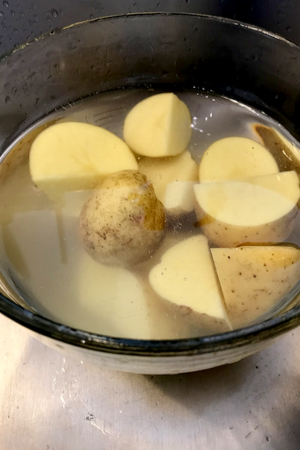 Rinse your potatoes in cold water for 3-4 minutes, removing any excess starch. Place a collapsible steamer basket into the liner and add the potatoes on one half of the basket. 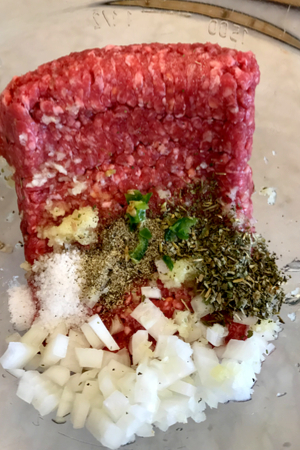 Combine the ingredients for the meatloaf in a large bowl until fully combined. Brush the top with additional barbecue sauce if desired. Place the meatloaf in a mini loaf pan. Place the meatloaf on half of the steamer basket and secure lid with the vent in the sealed position. Pressure cook/Manual for 20 minutes. Once finished cooking, perform a quick pressure release. Using a food thermometer, check the center of the meatloaf for internal temperature of 155° F. If the meatloaf has not fully cooked, place back into the Instant Pot and cook for an additional 5-10 minutes until the internal temperature has reached a minimum of 155° F.
Carefully lift the meatloaf out and drain any excess grease that has collected in the pan. Optional - brush with additional barbecue sauce and place it on a top rack in the oven. Broil until the top sauce has begun to caramelize. Remove the potatoes from the pot and drain and reserve the liquid from the liner. Place potatoes directly into the liner. Add the butter, sour cream, milk, garlic salt, and salt and pepper to the potatoes and mash until the desired consistency has been reached. Use the reserved liquid only if needed to achieve the texture that you prefer. 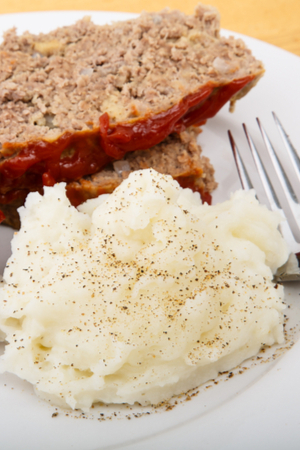 Slice the meatloaf and serve with the mashed potatoes.